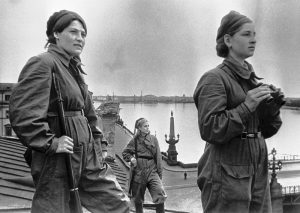 Who was defeated in the Great Patriotic war? I am sitting here watching the Victory Parade live – VVP’s speech this year was different in tone. He was stern and passionate – it was a message to those outside of Russia too. Never on our soil again – he was stressing. The planes have been grounded due to weather sadly, but at least the rehearsals would have shown the planes and helicopters. 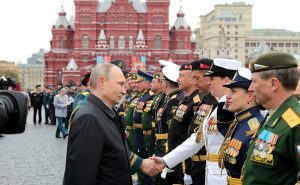 During the celebration with the veterans of the Great Patriotic in Kremlin, Putin made a statement about a fate of the Russian people if the Nazi Germany would win the war. “This sacred holiday is celebrated by all of Russia. And it is clear why. It is not just the many millions of victims which our people sacrificed on the altar of Victory. If our country would have succumbed to the terrible tragedy and, like many other European countries, suffered defeat, a totally different fate would have awaited us than the enslaved countries of the European continent. It was not only a question of the existence of our country, it was a question of the existence of our people as an ethnos. And we are well aware of this from the documents of the Nazi party and the fascist state which are still stored in archives. Those who were not used for slave labour would have been subject either to physical elimination, plain and simple, or resettlement to remote regions without any infrastructure where they would have been doomed to gradual extinction. Let’s remember that it was not Germany alone that attacked us, but all European nations took a part in this war against us. What moved those ordinary Europeans? Why did they decide to put on military overcoats, to take weapons in their hands and to invade our motherland? The results of our policies are unique in all the world. Our economic and social reorganization has led to the systematic elimination of social and class barriers, with the goal of a true people’s community. You can read the full speech here. It’s very long, confusing and anticlimactic, as everything that Hitler wrote, and you can discover a remarkable wording identical to those of the U.S. defense news and the U.S. senate speeches. later joined by 3 Italian teams and the Spanish “Blue division”. Besides Hungarians, Romanians, Finns, Italians, Slovaks and Spaniards who attacked our country in their national divisions and brigades, in the ranks of Nazi troops that broke into our land there were hundreds of thousands of French, Belgians, Dutch, Poles, Czechs, Danes, Norwegians, Bulgarians, Croats, Luxembourgers, Jews, etc. All European nations, with some rare exception, treacherously and suddenly attacked us and began ruthlessly killing civilians. From a remarkable collection of letters coming from the invaders back home in summer of 1941. “…The Fuhrer is extremely pleased that disguise of the preparations for the Eastern campaign was quite successful, and the entire maneuver was performed with incredible sneakiness. …Preliminary results suggests that the war in the East has been largely won: two-third of the Bolshevik forces have been already destroyed or badly frayed… five-sixths of the air and armored forces can already be considered destroyed. …The repetition of the fate of Napoleon impossible, though — the irony! — we are opposing the Bolshevism that night, when Napoleon crossed the Russian border. …The Fuhrer intends to erase from the face of the earth cities like Moscow, Kiev and St. Petersburg. And it is necessary! For if we want to dismember Russia into separate parts, this huge state should not have any spiritual, or political, or economic center. It’s been already a week and a half as we have been fighting and moving forward. Raging fires are everywhere, and there are huge black pillars of smoke. Any compassion towards the Russians is impossible, we exterminate fleeing Russians in huge quantities. There are thousands of corpses lying in the fields, on the roads and in the villages. No one removes or buries them. We should be glad that the führer fooled Stalin and hit sooner, than the Russians were prepared to repel our attacks, because if they were ready, the things wouldn’t go so well for us. Now it is clear that the outcome of the war is predetermined, and Russia sang it’s last song. Every day confirms the words of the greatest of men our commander Adolf Hitler that this war is a crusade against the Bolsheviks and Jews is the most sacred of all wars in German history and for this reason we scarify everything. Dear mother! Ukraine is a fabulously rich land, the fat black Ukrainian earth was created by God for the German ploughs. Ukraine could feed not only Germany, but all the annexed countries and territories. We live here like gods. Chickens, geese, eggs, roast, butter, cream, sour cream, juices, wine, honey — every day. But to take it from the hands of these dirty and sick people are dangerous and scary: I couldn’t put anything in your mouth they offer, so we take it all by yourself. It’s very simple, without much discussion, but following the German purity. If we want meat, we take an alive pig and slaughter it, the same with calf or geese. If we want fresh milk, we milk the cows. If we want honey, we get it right from its comb, and doing it so cleverly, that not a single bee would bite. Right now my friend calls me, he opened a hive and I am dying to try fresh honey. We have every right to believe that all this wealth and abundance belongs to us. If someone does not like it, we just stick a gun between their teeth and they go silent. The same our soldiers do when they need a woman. As you know, while we’re here we don’t have to polite with this lowlifes. They are especially afraid of us the “SS” forces. I feel like a winner every step of the way, it feels amazingly nice to show that we the Germans, are the lords and absolute owners of everything around us. I like this kind of life very much. My priceless treasure! For a month we advanced East 750 km, all goes according to the Fuhrer’s plan, and in August we should be in Moscow. After the surrender of Russia, it will be the British turn and then America’s. The commander of our battalion, major Seifert is convinced that every Russian should be killed everywhere, and we have this task performed. The blue, almost new suit for our little Puni, there are some blood stains. I’m sorry, my heart’s treasure, but we are in the field, to wouldn’t be that difficult for you to get rid of blood stains with the help of my uncle Herbert. You wrote about some paintings in gilded frames and other art objects. I remember this all the time, but found nothing suitable so far. Nothing good or valuable, nothing you dream of for our cozy place. I kiss both of you long and strong kiss. The materials that we have sent demonstrate that you are totally missing out on one of the major issues in our propaganda. You strive to capture the victorious advance of our troops and make it highly professional. However, you ignored the most important task. 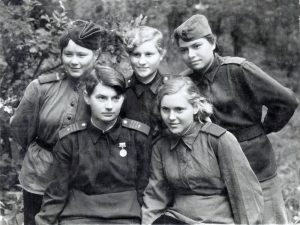 We should immediately, clearly and convincingly show to the German people and all of the Europe, that Soviet Russia is a multimillion assemblage of racially inferior and degenerat bastards: Jews and Asians, who represent a terrible danger to civilized humanity. 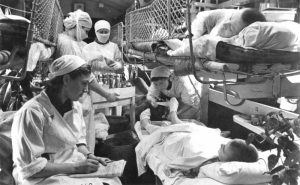 In this aspect, pay attention to the experience of Dr. Muller, who in Ukraine found in one mental hospital two dozen of mentally ill, and dressed them into the uniforms of commanders and commissars of the Red Army. He photographed them under different angles, dirty and unshaven, and created the whole gallery of disgusting, repulsive, aggressive idiots that makes a strong impression. Also, what deserves your attention is the work of Dr. Hecker, of filming the civilian population near Minsk. For greater credibility he used accompanying text of the chronicles and make them look even more disgusting by dressing those civilians in rags: old sweaters, torn jackets. The men are unshaven, barefoot, in dirty shirts, without ties, holding their falling down pants, since he took their belts. Unkempt women with the brutal expression on the faces we made to hold axes and pitchforks. These images also evoked an active distaste and disgust. Of course, there should not be a template, maybe you can create a variety of solutions. However, when photographing the Russian prisoners of war and local population it is necessary to try to show the ugliest of Jewish and Asian types, whose faces express anger and hatred and can cause in response only similar sentiments, and, above all, disgust and hatred. You participated in the battle for Smolensk? Three time I watched chronicled in “Vohenshau”. What a grandiose view! On the screen tanks were moving, guns rumbled, and our tanned, dusty, smiling young men in shirts with rolled elbow-length sleeves, among them I was hoping to see you my favorite person. And then the field that has been littered with corpses of Russians, and the columns of prisoners of war. Those horrible alive Russians, they look like beasts, just looking at these creatures we can see the horror, a horrible mob that you must fight! Their country is so terrible, so terrible that I don’t know how you and your soldiers are moving forward there. When I see this on the screen, only then I realize what you, poor boys have to endure. However, I hope that the greatest challenges are already behind you, Moscow will fall soon and the war will end. I pray daily for your return. Send you greetings and kisses with a caring love — your mother. My dear! I have received your letters No. 4 n No. 5, and No. 3 is still not here. Parcel No. 57 of June 30, No. 12 dated July 4, and No. 86 dated July 9, I got one too. The clothing and footwear from Russia do not have decent quality, clumsy and ugly. Do you think that I’m going to wear this?.. The Corporal Kurtof sent Mitzi three massive gold rings, pendant with large diamonds and fur of a beautiful silver fox. This has value. Mitzi gave me an advice: if you occasionally send gold and precious stones, to avoid possible hassles at the border, where the luggage of the soldiers are being examined quite carefully, it’s the best to stick jewelry into a bar of soap. On the radio right now there is an emergency message broadcasting about new major victories in the East. This is epic! What a great happiness to be these days a German! Keep on, but be careful! My dear hubby! Now, the direct road to Moscow is opened. Moscow is a big city, with a huge number of prostitutes, dirty and contagious. I understand that a young, healthy man need a relief time from time. In two little parcels I’ve sent you 3 cakes, 2 apples, cookies, a bag of sausage, cigarettes, and 20 condoms. If you love me and little Rosie, don’t do anything without them. This should be enough for awhile. I send you many greetings and passionate kisses. Dear boy! The newsreel that we watch 2-3 times a week, each time, horrified by an unprecedented poverty, abominable roads and unseemly types, with which you have to deal with. Oh, these terrible, criminal, stupid faces, apparently all Jews. And then some women with guns and pathetic, starving children, sick and infested with parasites. Whether these creatures and their entire criminal state has any right to exist? Imagine, Richard, that on these territories there are people, or rather, the large apes that think that their bestial existence is the Paradise. The movie theaters are filled starting with early morning. Every German wants to enjoy the sight of your victories in Russia and to see our enemies being brought to their knees. Even I, a kind middle-aged woman, a devout and exemplary Catholic, am getting a great satisfaction watching thousands of prisoners walking along the roads, these criminal types, and especially I enjoy the sight of countless corpses. I watch every newsreels for 3-4 times. Yeah, I’m not ashamed to say that the corpses of the enemies make me happy. It’s hard to accept the idea that such backward degenerate nation takes from us so many sacrifices. But this nation must be thrown away out of the history of the world like garbage, once and for all. God bless you as He kept you in Poland, in Holland and in France. Loving you to pieces your mother and grandmother. Veritas: ” It was an important piece of news that the UN had finally opened up the archives – despite US/UK trying to stop the info getting out. It also backs up everything that the site has always said. :…the Western governments, or at least powerful sections, were loath to hamper the Nazi war effort against the Soviet Union. Notwithstanding that the Soviet Union was a nominal «ally» of the West for the defeat of Nazi Germany. This perspective harks to a radically different conception of the Second World War in contrast to that narrated in official Western versions. In this alternative historical account, the rise of the Nazi Third Reich was deliberately fomented by American and British rulers as a bulwark in Europe against the spread of communism. Adolf Hitler’s rabid anti-Semitism was matched only by his detest of Marxism and the Slavic people of the Soviet Union. In the Nazi ideology, they were all «Untermenschen» (subhumans) to be exterminated in a «Final Solution».